At Lowell Animal Hospital, we understand that feline cancer is a devastating diagnosis. It is natural to feel highly emotional. However, a cat cancer diagnosis is not necessarily a hopeless one. Depending upon how early it is identified and the type of cancer involved, there are certainly options that can lead to very positive outcomes. It is important for you to understand that depending on the specific circumstances of your cat's condition, feline cancer may be treatable. Medical advancements have provided us with more treatment options for cats with cancer. However, the best way to prevent cancer in cats is to emphasize a healthy lifestyle and adhere to a preventive health care regimen. This includes regular wellness checkups with your veterinarian. Should you spot any symptoms, we urge you to see your veterinarian immediately. Only then can they perform the necessary diagnostic tests to determine whether or not cancer is present, and to what extent. 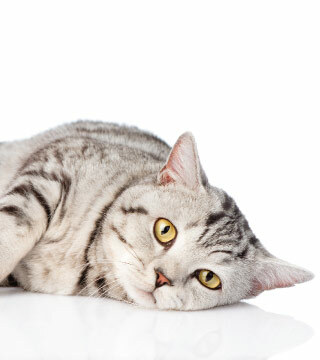 Cat cancer can be aggressive, and requires immediate intervention. If cancer is diagnosed early, the prognosis for recovery increases significantly. There are various types of feline cancer. We have compiled a short list here, meant only to serve as an introduction to some of the more common types of feline cancer. If you suspect your cat may have cancer, please bring your cat in for an exam with one of our veterinarians. The first key to cancer treatment for cats is proper diagnosis. At Lowell Animal Hospital, we begin with a full physical exam. We commonly look at blood work and when necessary employ the use of diagnostic imaging such as radiography or ultrasound. We will also perform needle aspirates, which is a form of biopsy where a needle is inserted into the tumor to collect cells for use in determining tumor type. This is a non-painful and minimally invasive method used for diagnosis. Some tumor types require a core biopsy for diagnosis. In certain cases, cancer specialists may be employed for further diagnostic testing (such as MRI and CT scans) and to be part of our team in treating your cat's cancer. Other treatments may include acupuncture, immunotherapy or nutritional therapy. If you suspect cat cancer, whether finding a lump or noticing behavioral changes, please contact us immediately or visit one of our doctors. Our veterinarians and veterinary support staff will provide you and your feline friend with compassionate, comprehensive care and support services. Although cat cancer can be frightening and painful, we are here to help ease your cat's pain and suffering and eliminate the cancer through the best veterinary care available.